Here's information that you need to make a new map for VU. The map needs to be repeatable! So if you put two maps beside each others it needs to have a smooth transition over the edges. No cut rivers etc. The map needs to have mountains, water, trees and rivers. These are guidelines, although, it's very important that the terrain is not smaller then 40x40px. 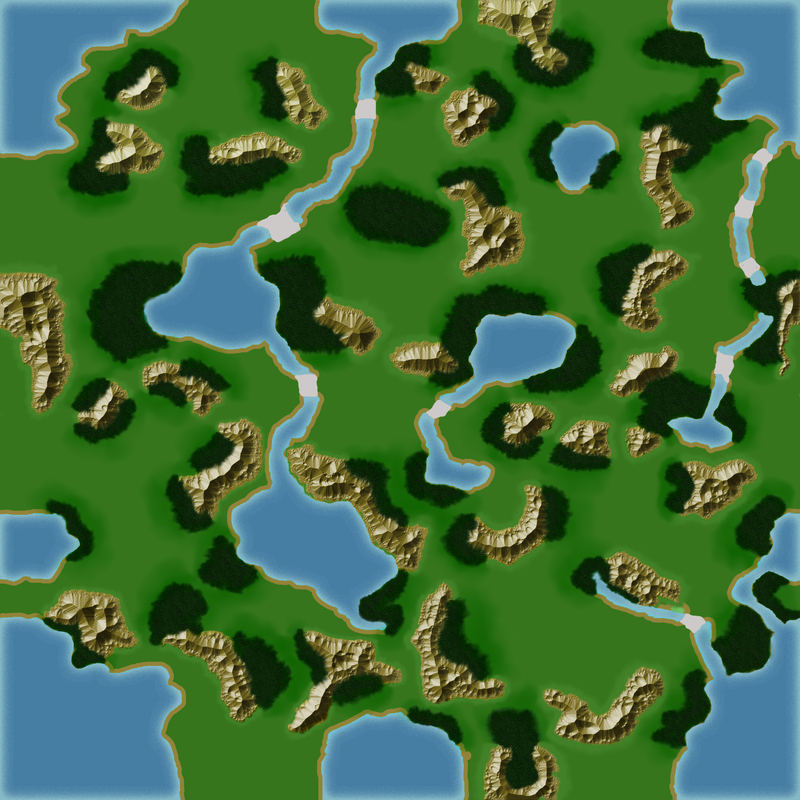 And a river is not smaller then 20x20px. The rivers can have a round shape, but the other terrain should be somewhat square. The smallest passage needs to be 20px or bigger for an army to be able to go through. The default size of a world is 5000x5000px, so your map will most of the time be looped twice (2x2). And a default (2x2) map should be able to hold at least 50 players. Could you post the images you used to make the trees, mountains, etc? There is a link to a map i made. Didnt put too much thought in the design and layout, and i could refine it more as well. Im posting this to see if zeta likes it and what needs to be done to meet the requirements before i move forward with refining and creating new maps. If you have a real strategic design that you want implemented, ingame message me and let me know. I could make it and post it here. Also, the map quality will blur if you zoom in too much. It should be stable if you keep it at least above half zoomed (which would probably be good enough to visually play). Set zoom to 70% to see the optimal textures and qualities of the mountains, trees, and rivers. Hope yall like it. Helpful comments are welcome. Hey so i drew a design for a map i was thinking of. Could you guys take a look at it and see if its a good map. If a few vets could look at it and tell me if the map has valid and strategic points of defense not just in this picture but a repeated image (such as shattered worlds does in fantasia). If you find flaws, please make suggestions on how to improve it. Map 2: revised copy of previous map. To allow more opened up spaces for larger cities, and less defensive by removing several blocker positions. glancing over it while scaled to 2500x2500 px, i personally like the way it is set up, you cannot block off large chunks of land that can accommodate an entire kingdom with only 4 blockers - there are plenty of routes to attack. it seems like a fun map. i also personally feel that the river/tree at 32,10 and 32,11 (PIC) should be removed and made into empty plains, and possibly the lake terrain above that changed to mountain terrain. thank you for your input, greatly appreciate it. Passage 23,22: will be expanded enough to fit a blocker of small size maybe 6400ish or 14400 blocker. So no worries. River 32, 11 + 10: can be changed to a mountainous terrain. however, the whole lake itself is benefiting the southwestern side of the map by providing a food source bonus other than the river surrounding its eastern border. So i guess ill cut the top half the the lake and change it to a mountainous terrain. 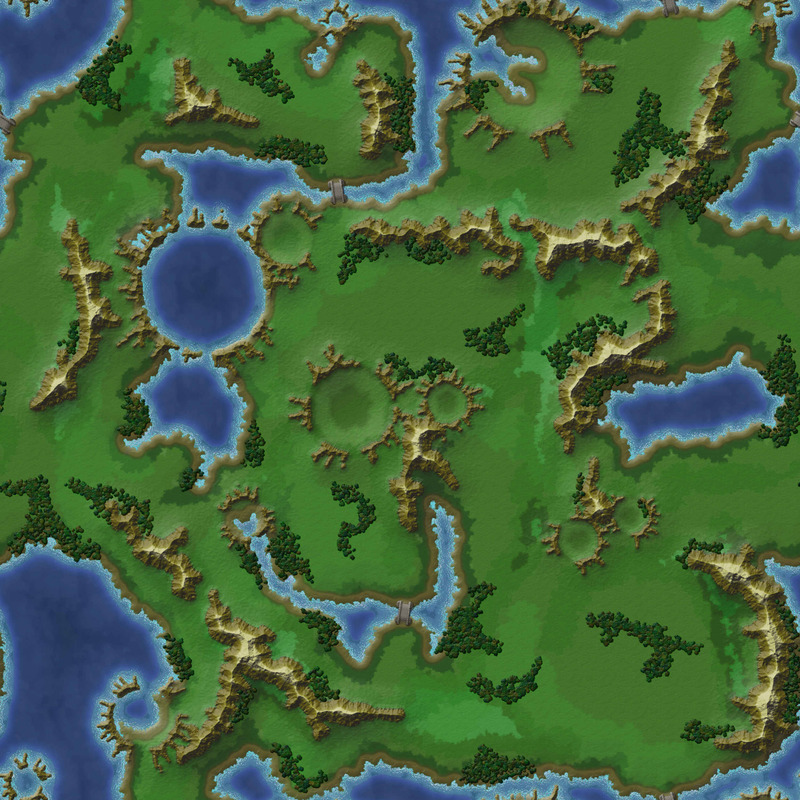 Resizing wont be a problem, ill be designing the map with the specified 2500x2500 px specs in photoshop. This is merely a design i drew on paper. Any extra space will be added as empty grassland to allow larger cities. horus map is actually fine in terms of space when it is scaled up. larger kingdoms don't need to be accommodated, imo it's actually the smaller kingdoms and solo players that should be thought about when a map is created. So why exactly cant it just be one tile that is the size of the finished product tiled maps? I would be all for making one for you guys then. I don't know how, anyone else? Here is my idea for a map shown in four tiles. It's a rough drawing and would need to be larger. Any input would help. I know I am missing some trees in the lower left corner area. The black lines represent bridges and cave passages. It's nearly impossible to get from the top tiles to the tiles on the bottom....maybe adding a few bridges there would help! Yep, but its still seems pretty much impossible to reach the upper 2 squares from the bottom 2 squares. 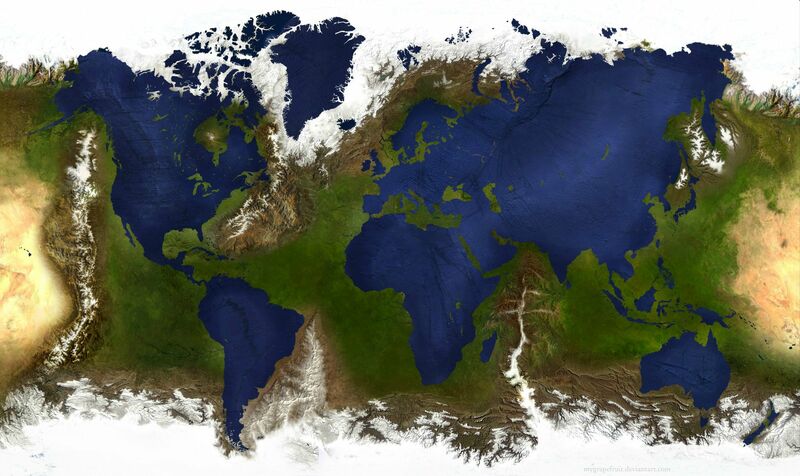 ^Something tells me its suppose to be like that, but I do agree its a bit extreme, I like the map though. Salamon, your map is just gorgeous. Salamon you should either message ZeTa directly when the map is finished, or message Dragon since I think Zond is bussy with rl. I read mails, and half play now. So i can still do stuff like talk to zeta and etc. I'm not sure on what step to take next. I know I need to get the size right. Should I make it solid colors first? Anyone have suggestions for map editors or a way to make this without one? Is anyone interested in making a new map? I have decided that I will attempt to make a map as close to Middle Earth and of westeros as possible. Any help would be appreciated. wouldnt be able to to eather.. you need to make it soit can be placed in blocked next to each other. Yeah... Unless Zeta were willing to accept a map blown up to the dimensions of 4x4 as a special case. I mean, I figure it would be a small adjustment, but I'm sure there's things we don't know about the game code. Now being a socalled "pensionist" :big-grin:, I sometimes have too much time, so I'm fooling 'round a little to make a map (geeee - one more lunatic.... Yes????). Is it enough if it is a simple .jpg map size 2.500x2.500 px with distinct "main" colors for water/rivers, forrests, mountains, bridges and plains for building/move ("free space"). Something that a human without much problem can identify???? The size of passages. It should be 20px Zeta demands. BUT. What if a passage/a bridge is smaller, say 10-15 px. Would that allow say a small unit such as a scout or up to a "triple-bar" army to pass. But block armies bigger than "tripple-bar"?????? In other words, does armies in general use more-and-more px the bigger they are????? That knowledge could be usefull in case you want to make some real tricky hot-spots on the map (without any changes to the game-engine itself). Yeah... Unless Zeta were willing to accept a map blown up to the dimensions of 4x4 as a special case. This would be absolutely brilliant! My map isn't finished yet. I still need to color the plains and making the map look nice all over - at least do my best. I don't have any advance graphic program to help me, so it's hard work combined with my fantasy. Some elements are "stolen" 100%, many changed in some degree and a few really changed or completely new. I got a few input in the RoC-forum, where I have published the first very raw drawings of the map. Now it's time to see what "you" say. The map will be posted after this. Here it is. Comments please. If you can - I would suggest including some more entrances to each of the "cores". Currently, there are multiple core locations which are easily defend-able with only 1 or 2 blockers. This will lead to huge stalemates and the "largest-kingdom-wins" setup, since all you have to do is stack your couple blockers with as many troops as you can. Your current map setup could work well for zetamania (due to the presence of merges), but I don't think it'll work well for the other worlds (i.e. Fantasia, Mantrax etc.) unless you add some more entrances to each of the cores. Agree there are areas with only one-two-three entrances, but that is my intention. Solo-players and small kingdoms should also be able to have fun on this map. Besides, none of those "cores" are big. So if you play in a larger kingdom, you will need several core-areas and therefore you will also have many more hotspots to take care of. I have just made one trialmap 2x2 so I'm able to see it as a whole, which I'll take a good look at. I might very well end up with more bridges/entrances for some areas as you suggest. But let me have more comments please. I do not have time to change much before Sunday (DON'T think I'm inactive, I'm not). I'm still filling out the plains and try to give the map a nice look. After that, I'll save a copy and try to make some more entrances to some of the small "cores" to make it a little more difficult to dig in (Stewie suggestion). Don't think I hasn't worked more on it - I have. My problems is the colorchanges in the plains. They looks ugly somewhere. I have downloaded GIMP, and I'm trying to find out how it works. Maybe I'll find a solution there. A good map both strategic and visual IS most important for this game. My map is finished and I have included a suggestion, that Stewie made in two of the four corners. The map is playable now I guess - but...... there still is some "problems" with the plains I don't like (it doesn't look that good all places). I'm still working to learn GIMP - and I'm doing progress. But not enough to use it to make my map really pretty. Tomorrow morning I'll try to upload the map to here. That GIMP-program just works (of course it does - I just have to learn the basic first). The map looks very nice now - need just a little more before I'm satisfied.